The U.S. Government requires UV lamps above cooling coils for all government buildings and schools in order to control microbial growth in buildings. Now the average homeowner can apply the same safety measures in their own living spaces. Considering the dangers of mold and bacteria in the home, it just makes sense to attack these problems at the source. 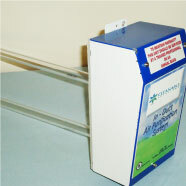 Now you can with our certified UV Germicidal Lamp. Placed on the inside trunk line of your furnace next to the coil, this UV light will kill as well as prevent mold growth and spores on your system’s air conditioning coils and air ducts, thereby providing the BEST protection available for you and your family. In-duct air purification bulbs use highly effective methods to clean the air in your home or building. This system has the power to remove particles of a much smaller size than even the best HEPA filtration systems, such as: viruses, odors, fumes, bacteria, smoke particles, gases, dust, allergens, and skin flakes. The chart lists the price variances between our competitors and us. Don’t settle for a UV lamp just because it’s cheap. These bulbs always burn out quickly, and you will find yourself spending more money in the long run. We cut one-inch holes inside supply plenum above the coil followed by the unit installation.